POLICE are appealing for witnesses after a thug, believed to have been drunk, beat up a 71 year old man after he asked him to stop abusing a bus driver. The victim suffered a number of injuries including a cut to his head and after treatment by paramedics was taken to hospital. The incident happened at 5.20pm on Monday evening on the No62 as it waiting outside the HSBC Bank on Church Green West. Eyewitnesses said a younger man had been abusing the bus driver, believed to be Polish, saying the bus should be the No58 service. When told it was a No62 the thug became aggressive which was when the senior citizen stepped in and told him to leave the driver be. Instead, the thug grabbed the pensioner, pulling his T-shirt over his head, and flung him across the bus before raining blows on his head as he lay on the floor. Horrified passengers tried to intervene and called for the emergency services as the thug ran off. “There was blood everywhere,” said one eyewitness. “He’d had his T-shirt pulled over his head and was lying bare chested on the floor of the bus. 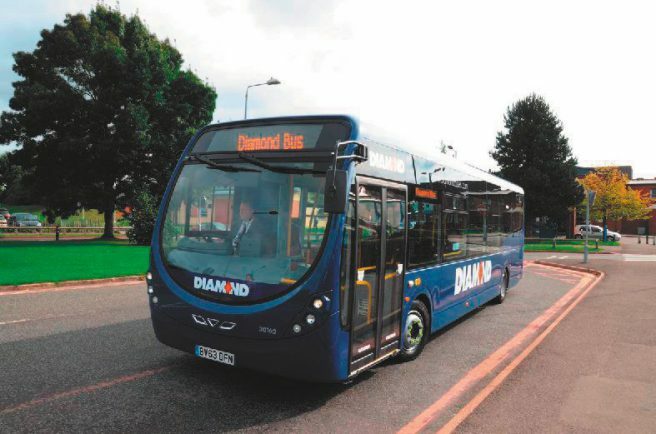 The incident is the third case involving threats and attacks to Diamond Bus drivers or passengers since the World Cup started. On Friday a driver was punched and cut by an abusive passenger nd there was an attempted robbery on a Diamond Bus later on Monday evening. “Our hearts go out to the gentleman who was injured trying to defend one of our drivers,” said Diamond operations manager Chris Bridges. It is believed the suspected thug is already known to Police. A spokesman said: “We are currently securing CCTV evidence which hopefully will identify the offender(s) who ran off from the scene and we would be grateful of any members of the public who saw the incident contacting us on x101 (log 613S 180618).